This three bedroom, two bathroom home is located right on White Pond. Relax and enjoy your morning coffee on your private deck overlooking the pond. The home has three bedrooms. The master bedroom with ensuite bath has one king bed. The second and third bedroom each have two twin beds. The home has two living rooms, dinining room, full kitchen, working fireplace, and outdoor charcoal grille. 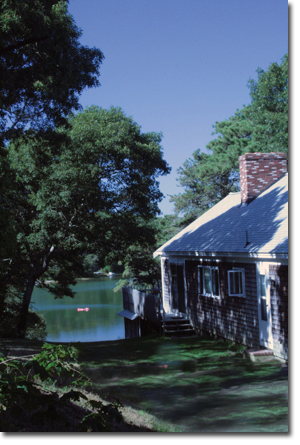 This home is part of Pine Shore Cottages, which has a private beach on White Pond, a 40 acre fresh water lake.